Studio 614 is a Local Columbus Small Business – Thank YOU for Shopping Small. We host open paint and sip classes all over the Columbus area every week, no reservations required. Prices depend on the venue and type of painting class, but are typically between $35 – $55 per person. Prices always include all of the painting materials, and yes you get to take home your artwork! Visit our UPCOMING CLASSES page to see a calendar with all of our upcoming paint and sip classes in Columbus! 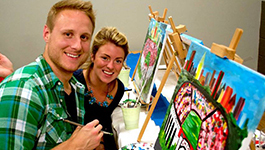 Private party pricing varies depending on which type of painting class you would like to book. We take reservations 7 days a week at a variety of different venues all around Columbus! Please note there is a $100 travel fee for any location within 10 miles of the studio. Contact for information about party locations greater than 10 miles. To book a party, check out the prices below then head to our BOOK ONLINE page! Be sure to check out our GALLERY page to see all of the different artwork on display. 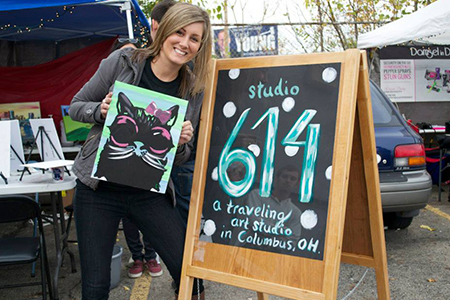 The Studio 614 offers open classes, private paint and sip parties, custom classes and more. Anyone can sign up for an open class, but if you’d rather plan your own party be sure to check out our private parties.